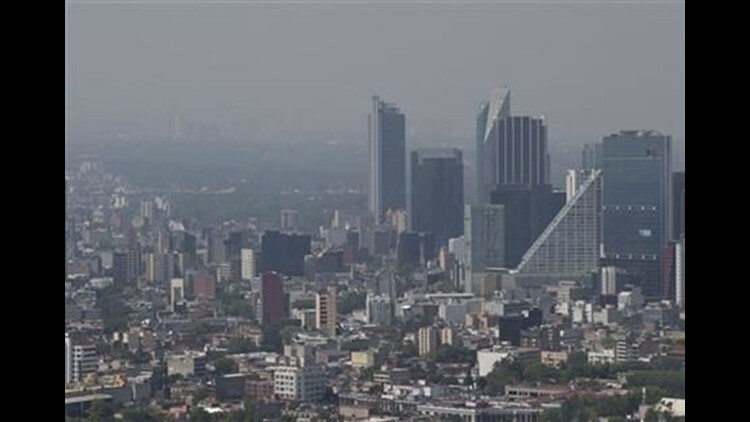 MEXICO CITY (AP) — Authorities banned hundreds of thousands of cars from the roads Wednesday and offered free subway and bus rides to coax people from their vehicles as Mexico City's first air pollution alert in 11 years stretched into a third day. Officials advised people to limit outdoor activity due to high ozone levels that were nearly double acceptable limits in the sprawling capital, which lies in a high-altitude valley ringed by smog-trapping volcanic mountains. Amid a muddy brown haze, some residents covered their mouths with scarves or paper masks as they moved through the streets. Some schools kept kids indoors during recess. Environment Secretary Alejandro Pacchiano said if conditions didn't improve, further measures might be considered, such as suspending industrial activity at factories. By late Wednesday afternoon, pollution continued above acceptable limits. Mayor Miguel Angel Mancera told Televisa news that about 1.1 million cars in the Valley of Mexico, including nearly 450,000 in the capital, were ordered off the streets under the restrictions. However, he later said only about 800,000 had stayed off the road. He didn't explain the discrepancy, but suggested some motorists drove despite the ban. According to the National Statistics Institute about 4.7 million vehicles were registered in the capital in 2014, the most recent year for which figures are available. Mexico City used to regularly reach high smog levels, but air quality has improved significantly since the 1990s. Among other measures, rules were put in place that aimed to limit the circulation of older, more polluting vehicles, and obliged car owners to get regular smog checks. But a court relaxed those restrictions last year in a ruling that authorities and environmentalists blame for a rise in traffic. Pacchiano said that decision put an extra 1.4 million cars a day on the streets. Mancera has complained that cities bordering the capital do not regularly restrict vehicle use even though they contribute greatly to regional pollution. More than 20 million people are estimated to live in greater Mexico City, but only about 9 million in the capital proper. Ozone is a component of smog that can cause respiratory problems. Mexico City's last alert for ozone was in 2002, and the last pollution alert for air particles was in 2005. The current ozone alert was declared Monday night.